Here you'll find a variety of preschool graduation crafts to help ease the transition to kindergarten. It's the end of the school year already!! Graduating from preschool is such an important milestone...let's celebrate it! Your preschoolers may be struggling with the upcoming changes: a new school, new friends, new teachers. They are likely filled with mixed emotions. 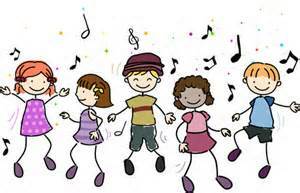 It is a big step to leave preschool and go to kindergarten as well as to move from their preschool classroom to prek. Creating preschool graduation crafts can help children become excited about the accomplishments they've made this year and look forward to moving on to the next phase of school! Let's look at 3 different types of preschool graduation crafts you can make in the weeks leading up to preschool graduation: Crafts to Display, Crafts to Wear and Crafts to Use! 1. Find a good size rock and paint it (perhaps one of your school colors). 2. After the rock is dry, use a piece of construction paper and cut out the shape of two feet. 3. Glue the feet to the bottom of the rock. 4. Either paint or glue on some googly eyes on the front of the rock. 5. 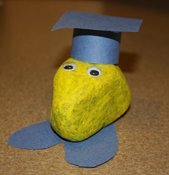 Make a tiny graduation cap and glue on the top of the rock. 6. Now you have a cute paper weight to hold all your important paperwork! 1. Take an empty toilet paper roll or paper towel roll and make sure there are no pieces of paper still clinging to it. 2. Glue a sheet of white paper all around it, leaving the end of the paper unattached so that it looks like it can unroll. 3. Tie a piece of yarn or ribbon around the middle and if you want, you can fray the ends to look like a tassel! 1. Cut a cardboard egg carton into the separate cup sections. 2. Turn them upside down and let children paint the egg carton section a school color. 3. Cut a square section of a piece of lightweight cardboard about 4-5 inches, paint the same color, and let both pieces dry. 4. When they are dry, have children glue the carboard onto the top of the egg carton section, so that it looks like a graduation cap. 5. Glue a small piece of yarn to the top of the cardboard to be the tassel. So cute! 1. Turn a plastic or paper bowl upside down and paint the school's color, if needed. 2. Glue a square of cardstock in a matching color on what used to be the bottom of the bowl. 4. Wrap yarn in coordinating color several times around three fingers. Leave about a foot of yarn on one end. 5. Remove from fingers and pinch together at that end. 6. Use another piece of yarn to wrap pinched strands together and tie. 7. Cut loops open on other side. 8. Push the long side of yarn through the hole punched in the top. 9. Tape on the inside to hold in place. If you are concerned about the cap staying on the child's head, you could attach a piece of elastic string to the inside of 2 edges of the bowl. 2. Tie a ribbon (or yarn) around the diploma, make a bow, and secure with glue. 3. Cut an oval out of craft foam in your school's color. 4. Use black marker to write child's name and the year across the bottom of the oval. 5. Glue the diploma to the top or side section of the oval and let dry. 6. Use glitter to draw a border around the oval. 7. Glue pin back to the back of the oval and let dry. Perfect to wear for graduation ceremonies! 1. This book would make a great teacher gift for the end of the year, too! 2. Take a picture of the whole preschool class, including the teacher. 3. To make the cover, attach the picture to a piece of cardstock, or to 2 sheets of construction paper that have been glued together (to make it sturdier). 4. Write the school name, teacher's name, and year on the front. 5. For the inside, place several sheets of white paper. 6. Put another piece of cardstock or construction paper on the back. 7. Punch 3 holes down the sides of the book. 8. Tie yarn or ribbon in the holes to hold the book together. 9. Place pictures taken throughout the year inside, and have each child sign their name (with help if needed) on the pages. This is one of my all-time favorite preschool graduation crafts!! I have done it with each of my own children and I can't wait to open them many years from now. I know this project works great with classes as well. Parents are also so appreciative of this special craft. 1. Cover the container with decorations: construction paper, wrapping paper, or to really "date" it - newspaper, paint, markers, stickers, glitter, pictures, jewels, etc. Make sure you write the year on the outside of the box. When you are finished filling the time capsule, "seal" it. You could just put the cover on it and set it in a safe place in your home. Or you could seal it with tape or glue so no one can peek! Decide on a date to open it again and write it on the outside. 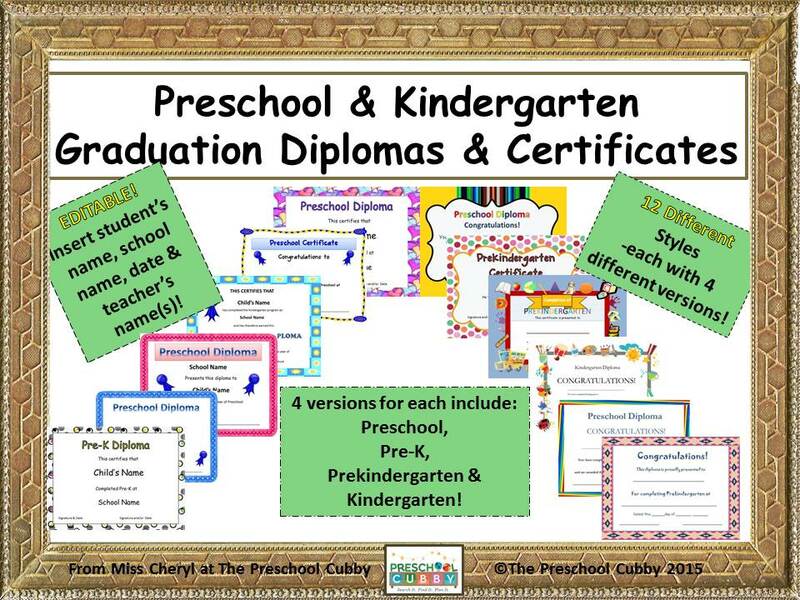 More Preschool Graduation Planning Pages for You!